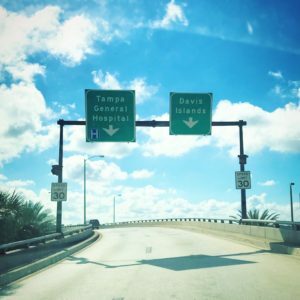 Make your way to the Davis Islands Bridge toward Tampa General Hospital. It’s just 5 minutes from downtown and visible and easily accessed from Bayshore Blvd. At the end of the bridge you’ll find a fork: taking the left will take you to Tampa General Hospital. Stay to the right to drive toward Davis Islands. After the fork, you’ll want to stay in the left lane to get to the shopping district. The right lane will take you to the exclusively residential section of Davis Islands. You’ll again arrive at another fork. Staying to the left will take you down East Davis Blvd. We’re located at 232 East Davis Blvd on your right, past the bank and past 220 East (restaurant). If you’ve reached the 7-11, you’ve gone too far! If you have trouble finding parking, there is parking available off the alley right behind the pharmacy. If you take the back entrance, ring the bell and we will buzz you in! Need additional help with your refill? Want to see if your prescription is ready? Call (813) 254-1888 to speak with our team today!